I wish they had this pack available when i first started all those years ago. Great value and essential tools all in one pack. Pencil Style Glass Cutter In life, you get what you pay for........ However these cutters are extremely good value and a great for beginners and night school teachers. Spring loaded, swivel head allows great cutting accuracy. Amazing value. !!! Cut Runners Used to break the score. Made from lightweight plastic, these have wide jaws, effortless to use. Any kind of tool that removes the DANGER aspect of breaking the glass with your hands must be a bonus. 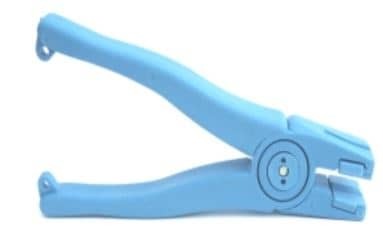 Grozing Pliers Grozing pliers are an essential tool for stained glass and glass fusing. Dual purpose for nibbling edges and breaking tricky cuts. Grooved teeth for crunching glass and an open backed jaw which does't crush the edge of your sheet when trying to snap off thin strips of glass. In life, you get what you pay for........ However these cutters are extremely good value and a great for beginners and night school teachers. Spring loaded, swivel head allows great cutting accuracy. Amazing value. !!! Used to break the score. Made from lightweight plastic, these have wide jaws, effortless to use. Any kind of tool that removes the DANGER aspect of breaking the glass with your hands must be a bonus. 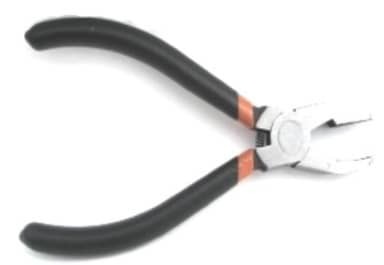 Grozing pliers are an essential tool for stained glass and glass fusing. Dual purpose for nibbling edges and breaking tricky cuts. Grooved teeth for crunching glass and an open backed jaw which does't crush the edge of your sheet when trying to snap off thin strips of glass.